Sealed and activated in the factory. Ready to use. Moto battery with GEL 12V 4Ah, YTZ5S, + terminal right. Yucell moto battery 12V 6.5Ah, YS12-6,5L, maintenance free, + terminal right. Yucell moto battery 12V 6Ah, YTZ7S (YT6B-3) is maintenance free, + terminal right. 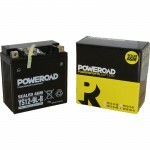 Baterie moto sigilata 12V 6Ah, Yucell YT7B-4. Tehnologie AGM/VRLA. Pentru scutere, motorete, mopede si motociclete. Borna + stanga. Yucell moto battery 12V 8Ah, YS12-9-BS, + terminal left. Maintenance free. Sealed. Baterie moto sigilata 12V 9Ah, Yucell YS12-9-B, cod YUASA echivalent 12N9-B. Pentru pornire scutere, motociclete si Jet-skiuri cu motoare pe benzina. Baterie moto sigilata 12V 9Ah, Yucell YS12-9L-B, cod YUASA echivalent YB9L-B. Baterie fara intretinere cu tehnologie AGM/VRLA. Borna + dreapta. Baterie moto Yucell 12V 8Ah, YT9-B4, borna + stanga. Yucell moto battery 12V 8.5Ah, YTZ10S, + terminal left, sealed, maintenance free. Yucell moto battery 12V 8Ah, YS12-9L-BS, + terminal right. Maintenance free. Sealed. Yucell moto battery 12V 10Ah, YS12-12A-BS, + terminal left, maintenance free, sealed. Yucell moto battery 12V 10Ah, YT12B-4, + terminal left. Moto battery 12v-12Ah,YUCELL YS12-14-BS,YUASA YTX14-BS, maintenance free, + terminal left.